Anatomy Glove Learning System consists of ONE glove with the bones printed on the front and back that you wear on your non-dominant hand and online videos that you watch. The videos show dissections and teach learners to draw hand structures on the glove. You develop a 3D understanding of hand structure and function and the anatomical basis of hand pathologies. It’s EXCELLENT study material to prepare for the CHT exam. And its fun! The Anatomy Glove Learning System was created by clinician/educators Pat McKee and Anne Agur from the University of Toronto, both with advanced degrees in Anatomy. Pat McKee is an internationally recognized hand therapist and educator and author of numerous articles and a textbook concerning hand therapy and orthotic fabrication. Anne Agur is an internationally recognized anatomist and is the editor of Grant’s Atlas of Anatomy and author of other anatomy textbooks. Please put in the COMMENTS section of your order if you want to order a left glove for a right handed person or a right glove for a left handed person. Please put in the COMMENTS section of your order if you want to order a left glove for a right handed person or a right glove for a left handed person. If you do not notate which hand we will send a left glove. 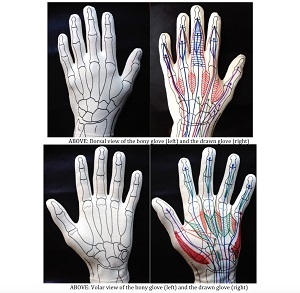 Understand the detailed, three-dimensional anatomy of extrinsic and intrinsic hand muscles, including specific attachment sites and the complex dorsal apparatus (extensor expansion). One Glove and 1 year Access to Online Videos included with this promotional offer! Bulk discounts available for teaching purposed. Please email: info@liveconferences.com for details. I loved how this clenched my understanding of the intrinsics. The 3-dimensional component made all the difference in the world. I ordered 40 of them for a class I taught and will use these again for the next class I teach.